Legends of the turf continue to gather at Old Friends for retired racehorses. 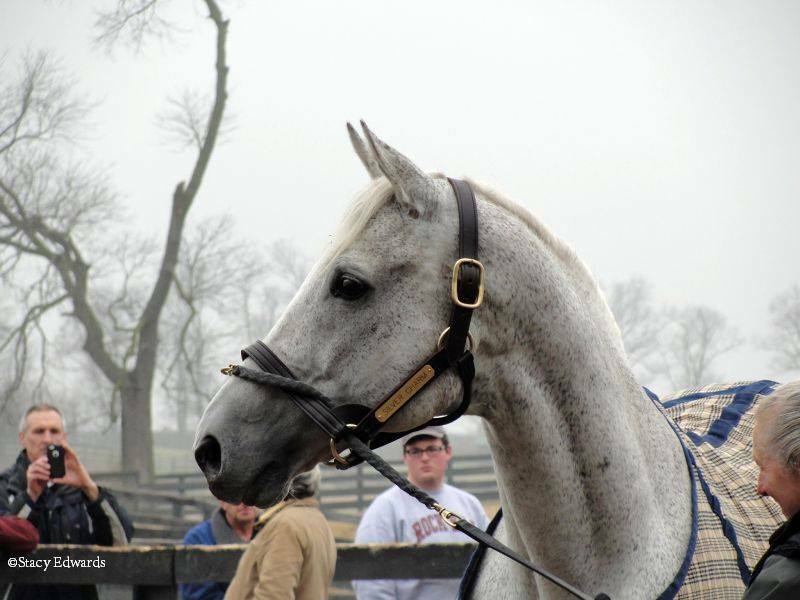 Kentucky Derby-Preakness 1997 hero Silver Charm is the latest edition to the family. Welcome home, Silver Charm! He went 12-for-24 and earned more than $6 million before retiring at age 5. 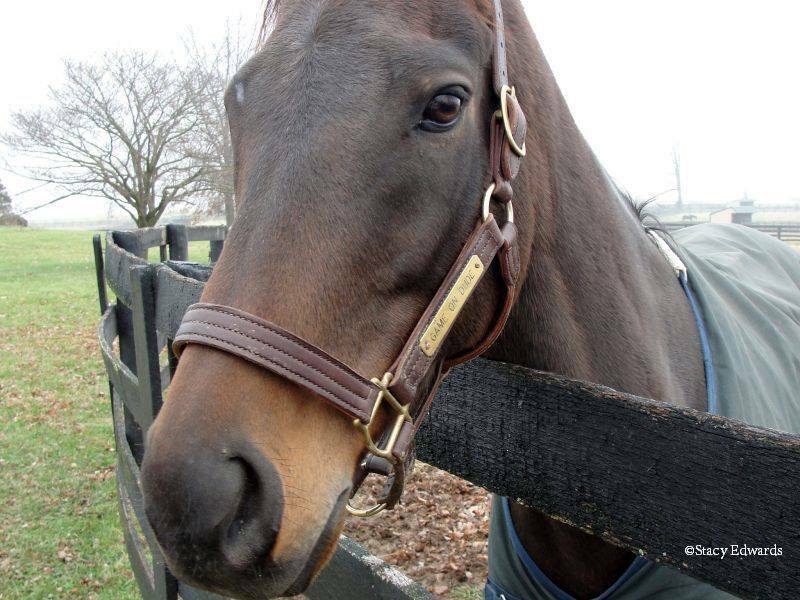 In 2000, he stood at Three Chimneys Farm in Kentucky and spent the rest of his stud career in Japan (2005-14). A deal was stuck with Japan, the Lewis family, and Three Chimneys, and he arrived at his new home at Old Friends on December 1, 2014. Before he entered quarantine, they threw a little soiree on Tuesday. Old Friends founder Michael Blowen could hardly contain his enthusiasm as he spoke to members of the racing press. Recent Southern California retiree Game On Dude, also a $6 million dollar man, is living the good life in Georgetown, KY as well. The gentle gelding walked right up to the onlookers and seemed to relish the multiple head pats. 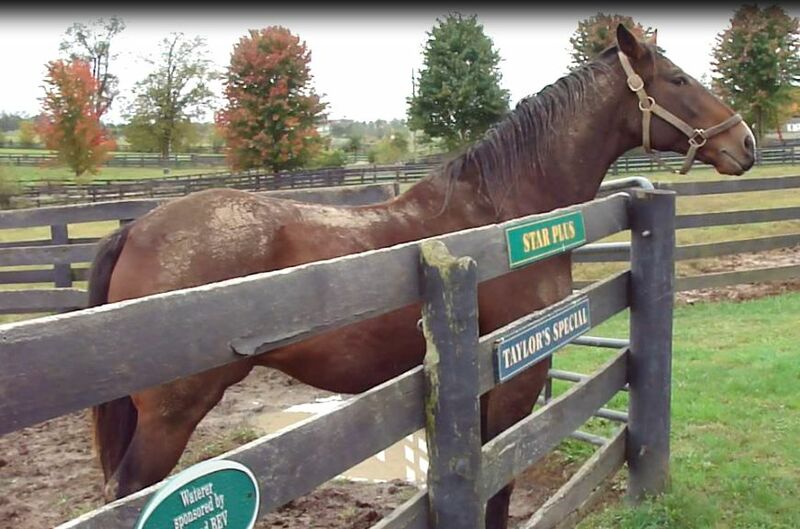 After Silver Charm’s moment in the mist, we asked Mr. Blowen if he would point the way to Star Plus. The last time we visited the farm, we decided to sponsor the 11-year-old gelding from Argentina. It was #GivingTuesday, after all! Mr. Blowen loaded us on his golf cart and away we went. Star Plus was more interested in his horse cronies but we still managed to snap a few nice shots. Visiting Old Friends is a walk down thoroughbred memory lane and we are already planning our next mini road trip to Georgetown! The 2013 Del Mar thoroughbred season wraps up on Wednesday, September 4. My Del Mar video series concludes below with a look back at Game On Dude’s Pacific Classic and a preview of closing week. Post positions were drawn for the 2011 Breeders’ Cup Classic on Monday and below is the advance I wrote on Horse Racing Nation. Uncle Mo gets the 5-2 morning line nod over Havre de Grace in Saturday’s Breeders’ Cup Classic at Churchill Downs. Two-year-old champ Uncle Mo has overcome health problems to be the improbable favorite in the biggest race of the year. The Pletcher/Repole runner was forced to miss the Triple Crown series with an intestinal problem and has been a force since returning at Saratoga. He ran too good to lose in the G1 King’s Bishop and exits a visually impressive score in the G2 Kelso at Big Sandy. He has yet to win beyond a mile and a sixtenth so Saturday’s ten furlong trip is a question he must answer. Havre de Grace will take on the boys but that should not pose a problem because she beat the gents in the G1 Woodward at the Spa in September. She tuned up for this with a facile triumph in the G1 Beldame and tries to become just the second female to ever win the BC Classic. G1 Jockey Club Gold cup hero Flat Out will try to turn the tables on Havre de Grace. The fantastic filly got the jump on him in the G1 Woodward but the ten panel trip might even the odds. He is training well for this engagement but both wins this year occurred at Belmont Park. Overseas invader So You Think gives conventional dirt a whirl for Aidan O’Brien. The classy New Zealand-bred has captured eleven graded/group events on turf in Australia, Great Britain, and Ireland from seven furlongs to a mile and five sixteenths. Saturday marks his third start in five weeks but he seems to thrive on activity and can compete here if he handles the footing. To Honor And Serve is stuck out in unlucky post thirteen and figures to attend the pace with railsitting longshot Prayer For Relief and G1 Goodwood winner Game On Dude. The Mott trainee exits back-to-back sharp prominent throughout wins including the G2 Pennsylvania Derby at Parx on Sept 24. PA Derby runner-up Ruler On Ice deserves a look at a big price. The surprise G1 Belmont Stakes winner gave To Honor And Serve ten pounds and showed newfound rallying ability over a speed favoring surface at Parx last time. He will be finishing under Garrett Gomez. Stay Thirsty hit his best stride at Saratoga this summer with wins in the G2 Jim Dandy and G1 Travers. He was last seen landing the show in the G1 Jockey Club Gold Cup and must prove he can fire a big shot away from his New York home. 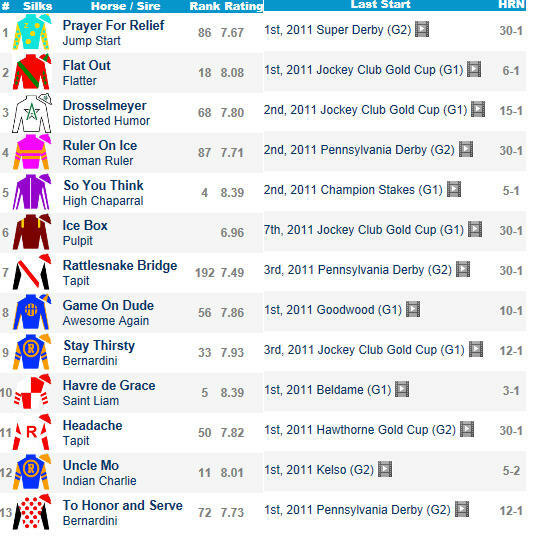 The remainder of the Breeders’ Cup Classic field consists of Drosselmeyer, Ice Box, Rattlesnake Bridge, and Headache. The road to the 2011 Breeders’ Cup Classic is back in full swing at Saratoga with the Grade 1 Whitney on August 6th. Post positions will be drawn on Wednesday morning and the stellar field is expected to include Met Mile hero Tizway, Apart, Duke of Mischief, Flat Out, Friend Or Foe, Giant Oak, Mission Impazible, Morning Line, and Rail Trip. G1 Hollywood Gold Cup winner First Dude has been retired because of a tendon injury. It is a real shame since he was just beginning to hit his stride. Gold Cup 2-3 finishers Game On Dude and Twirling Candy both have their sights set on the G1 Pacific Classic on Aug 28. The latter worked a strong five furlongs in :59.60 at Del Mar on 7-31. The local prep for the Pacific Classic, the G2 San Diego, was captured by veteran Tres Borrachos. The former frontrunner is now coming off the pace for his new conditioner Marty Jones and he smartly ran down vastly improved early runner Kevlar Kid at Del Mar on Saturday. The Del Mar showcase might also include Blind Luck, Bourbon Bay, Caracortado, Make Music For Me, and Setsuko. I have been covering the 3-year-old-crop of 2011 on Pick 6 Blog since last September and posted my latest Top 10 list on Aug 3. My top ranked sophomore Coil proved he deserved top billing with a sharp late running victory over Shackleford in Sunday’s Grade 1 Haskell at Monmouth Park. The Bob Baffert trainee has shipped to Saratoga with an eye on the Aug 27 Travers Stakes. Shackleford is also expected to make his next start at the Spa, with the aforementioned Travers or the Sept 3 Woodward against older rivals as possible engagements. Belmont Stakes hero Ruler On Ice is headed to the Travers following a solid show finish in the Haskell. I have always been fond of Stay Thirsty and he had his coming out party at Saratoga on Saturday. The smashing Jim Dandy winner earned a 106 BSF and has finally put it all together. The Travers is next for the Todd Pletcher trainee. Earlier in July, Dreamy Kid beat Coil in the Swaps at Hollywood Park, and he gets a chance to prove that was no fluke when he starts as the likely favorite in the Grade 2 West Virginia Derby on Aug 6. The road to the 2011 Breeders’ Cup Classic has been a bumpy one in the handicap division and win streaks have been few and far between, but First Dude pulled off a rare hat trick in the G1 Hollywood Gold Cup. First Dude’s sudden winning spirit can be attributed to trainer Bob Baffert and his newfound patient running style. He garnered a 106 BSF for his Gold Cup nose decision over stablemate Game On Dude. Beaten favorite Twirling Candy was another neck back in 3rd, followed by Setsuko and defending champ Awesome Gem. The SoCal crew could meet again in the Aug 28 Pacific Classic at Del Mar. The local prep for the Pacific Classic, the G2 San Diego, will be run at Del Mar on 7-30. The next major race for older horses is Saratoga’s G1 Whitney on Aug 6. The stellar field is expected to include Giant Oak, Morning Line, Rail Trip, Sidney’s Candy, and Tizway. I have been covering the 3-year-old-crop of 2011 on Pick 6 Blog since last September and posted my latest Top 10 list on July 12th. My top ranked sophomore Coil was shooting for a four-bagger in the G2 Swaps but was headed late by Neil Drysdale longshot Dreamy Kid. Coil ran well chasing slow fractions and was simply outfinished in a typical synthetic race. The son of Point Given could go much better on conventional dirt in either the Haskell or West Virginia Derby. Dreamy Kid has the right connections and owns a late blooming pedigree so his Swaps surprise may not have been a fluke. Two upcoming big 3yo races, the G2 Jim Dandy (July 30) and G1 Haskell (July 31), could provide some much needed clarity to a chaotic division. The Jim Dandy is expected to include Alternation, Brilliant Speed, and Stay Thirsty. Pants On Fire, Ruler On Ice, and Shackleford are the marquee Haskell names.